There's been a lot of activity at the Civilian Conservation Corps (CCC) Museum of South Dakota over the past few months. On June 16, 2018 the Civilian Conservation Corps held its annual open house. Members of Stan Baer's family were in attendance and pointed out Stan in one of the display photos. Stanislaus J. Baer (Stan) was from Ipswich, SD and in 1934 was with Company 1789, Camp Pactola. 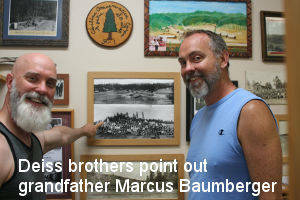 Deiss brothers point out grandfather Marcus Baumberger in one of the display photos at the Civilian Conservation Corps Museum of South Dakota. The Rapid City Club for Boys spent time at the museum. We had a group of educators from around the state and Boxelder Job Corps visited. Families have been in to find a relative in the roster of over 20,000 names of CCC men. We have received some wonderful photos, discharge papers, and enrollee names have been found. A beautiful original painting by a CCC Boy has been added to the collection. The Civilian Conservation Corp (CCC) Museum of South Dakota is located in the Hill City Area Chamber of Commerce Visitor Information Center. The "VIC" provides visitors to the Black Hills with information about local attractions, places to dine, accommodations for a night, a week or longer. This is the first stop for many visitors to the area. Like to hike or off road? Need information about local businesses? The friendly staff at the VIC are always ready to help. 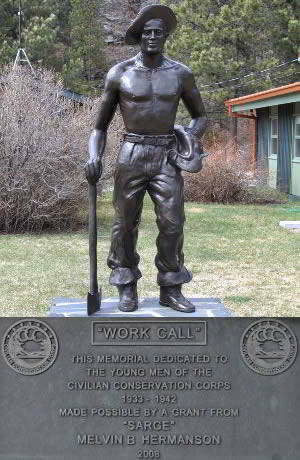 The lakes, roads, trails, bridges, state and national parks have been built by or improved by the men of the Civilian Conservation Corps. Check out the history, find a relative's name in the roster or share your photos and stories about the CCC. Stop at the VIC and visit the CCC Museum of South Dakota. The National Society Daughters of the American Revolution (DAR) was founded on October 11, 1890, during a time that was marked by a revival in patriotism and intense interest in the beginnings of the United States of America. Every year folks love to come to the open house. This year museum board member Kerry Conner drove down in his restored CCC themed pickup truck. Speaking of trucks! The truck above is a 1939 Dodge owned by Rod Schafer. It was used by the Civilian Conservation Corps at CCC Camp Pactola. It was on display during the 2018 museum open house. 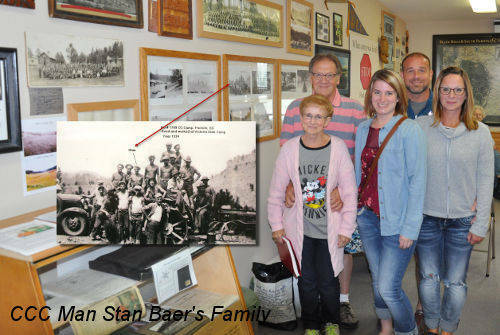 The Civilian Conservation Corps (CCC) Museum of South Dakota located in the Visitor Information Center in Hill City, SD had 15 visitors from the Rapid City Club for Boys. We talked about the Great Depression, the Dust Bowl Day, and looked at the tools used back then. We enjoyed having them and perhaps parents, grandparents,and great grandparents will be in for more questions after this visit. We reported earlier that a TIE group of educators from around the state visited the CCC Museum. This group will take the story of the CCC back to the classroom. The Boxelder Job Corps Civilian Conservation Center is located on the site of one of the organizational camps constructed by the Civilian Conservation Corps in 1936. It was taken over in 1965 to house one of the first Job Corps centers.